Are you looking for a practical stick vac to help you keep your home tidy at all times? Maybe you already have a sturdier vacuum, and you’re looking for something for smaller cleanups. Or perhaps you want a to replace that corded upright with a more convenient and compact cordless stick vacuum? You're in the right place! Here are the best stick vacuums for removing pet hair right now. And make no mistake - these products will get the job done. Check the latest price! Check the latest price! Check the latest price! Check the latest price! Check the latest price! Check the latest price! Check the latest price! Check the price! Check the price! Check the price! Check the price! Check the price! Let's dive in and find out which vacuum fits your needs the best. 4 Buying guide - how to choose a perfect lightweight stick vac? Basically a Dyson, but with a smaller price tag. Excellent design with superb features and attachments. Large dirt cup, HEPA filter and a motorized brush roll tool for pet hair. It has everything a pet owner could wish for. Check the latest price here. You may not be familiar with the brand, but it is actually a division of Ecovacs, which is well-known for manufacturing reliable robotic vacuums since 1998. This new stick vacuum from Tineco is very much like the famous Dyson stick vacuums – but with a lower price. It has an excellent runtime, powerful suction, and many handy features. The package includes useful attachments, and with the large dirt cup and HEPA filter, this vacuum is pretty much the perfect package for any pet owner. In addition to all the terrific details and features, Tineco products also get very high ratings from users, and the vacuums perform very well in tests. It seems like this vacuum has it all. Let’s have a closer look at the tech specs. Tineco actually has two different stick vacuum models (A10 and A11), and both of those two vacuums have two different sets of attachments available (Hero or Master). This chart will give you an idea of the differences and help you decide which vacuum would be the ideal one for you. We will be introducing the Tineco A11 Master because it’s the ultimate stick vacuum from Tineco with the most complete set of attachments. However, if you are on a tight budget, you any of the three other products would be excellent choices as well and save you a few bucks. Click here to see Tineco A10 on Amazon. All of these vacuums have the critical tools to keep your pet home spick-and-span – the A11 Master just has a few cherries on the top. The two interchangeable batteries enable an excellent runtime of 60 minutes. Using the MAX mode will take the runtime down to 15 minutes, which is still very impressive considering the strength of the suction. The suction power is 120AW which is fantastic for a cordless and lightweight vacuum in this price category. Combined with the functional attachments, this vacuum offers impressive cleaning results and incredible performance. The vacuum weighs only 2.68 pounds without the wand and attachments and 5.5 pounds altogether which is very lightweight for a powerful stick vacuum like this. The weight distribution could be better since the vacuum feels slightly heavier than it’s actual weight. But since it’s a very lightweight vacuum, this is only a very small shortcoming. The A10 and A11 vacuums have a trigger switch like the Dyson, but Tineco has also added a switch lock that can hold the power on without having to keep the trigger down while vacuuming. The vacuum is not quite as easy to handle as the Dyson V8 it is often compared to, but we would say it's very user-friendly nonetheless. The array of attachments the A11 Master comes with is truly awe-inspiring. Other Tineco stick vacuums come with fewer tools included, but they all come with all the critical attachments pet owners need to keep their home clean. You can see the differences between the vacuums in the comparison chart. It will give you an idea of which model has the tools that answer to your cleaning needs. LED Multi-tasker power brush for all floor types. This attachment is the main cleaning head of the vacuum. It has a powerful brush roll that picks up all kinds of dirt and debris on all types of floor materials. It is an excellent all-around tool for keeping your home clean, although some users say that it is slightly more awkward to maneuver than the Dyson Torque Drive cleaning head. The attachment is 10.4" wide to offer a broader cleaning path and more area vacuumed at each pass. The LED Multi-tasker also has LED headlights which are great for visibility. This feature allows you to see all the dust and pet hair lurking under the furniture. Not only does it help you reach better cleaning results, but it also adds convenience to vacuuming. LED Soft-roller power brush for hard floor materials and large debris. This softer brush roll tool is specifically designed for hard floor materials like hardwood, parquet, laminate, and tile. The soft brush can pick up even larger piles of debris because it has a big opening in the front, and it gives you a polished cleaning result. The crevice tool and dusting brush are fairly standard, but very handy tools to have. The dusting brush is especially helpful when you use it to dust surfaces instead of a traditional duster. All the dust is sucked up by the vacuum cleaner rather than being wafted into the air by the duster. Although these two attachments are useful, what pet owners will really love is the motorized mini power brush. It is pretty similar to the one Dyson has, and equally as effective. It is very capable of removing pet hair from surfaces like upholstered furniture, carpeted stairs, pet beds, and car seats. These tools are an excellent addition if you want to use your vacuum to clean your car, or if you have vents, fans or other hard-to-reach spots to vacuum. The A11 also comes with two batteries and a Dual Charging Powerhouse for charging and storing the vacuum and the tools. Unlike the Dyson, this powerhouse is not wall-mountable, but it is a very convenient way of always having the vacuum and attachments in one place – charged up and ready for a cleanup. The dirt cup of the A11 has a capacity of 0.6 liters. That is a pretty large dirt cup for a lightweight vacuum of this size. It is more than enough the hold all the pet hair – even if you have more than one pet that sheds heaps of hair. The filtering is excellent as well, as it is a True HEPA filtration system. That means that it is fully sealed and no particles will leak out of the vacuum before passing through the 4-stage HEPA filtration system. Because of the highly efficient filtration, this vacuum can be recommended for pet owners suffering from allergies and sensitivities. The vacuum also comes with a rinse-free cleaning tool and an extra filter. Instead of having to rinse the filter under water and wait for 24 hours before you can put it back in, Tineco offers a rinse-free cleaning tool that will deep-clean the filter in just 10 seconds and bring back the suction if a dirty filter has blocked it. This tool is very convenient and users love it! PetHairPatrol loves Dyson vacuums, but now we look at Tineco with admiration. They have pulled of what all other vacuum manufacturers are trying to do: to combine all the best features in one powerful, easy-to-use vacuum – and to keep the price reasonable while doing so. Although it’s not quite as powerful, the Tineco vacuums really do give Dyson a run for its money. In comparison, the Tineco vacuum has a slightly lower suction in the normal mode when compared to Dyson V8, and weight distribution makes it feel a bit heavier. It is also not quite as high-quality when it comes to the materials. On the other hand, the Tineco has a few more attachments, and the price is moderate. 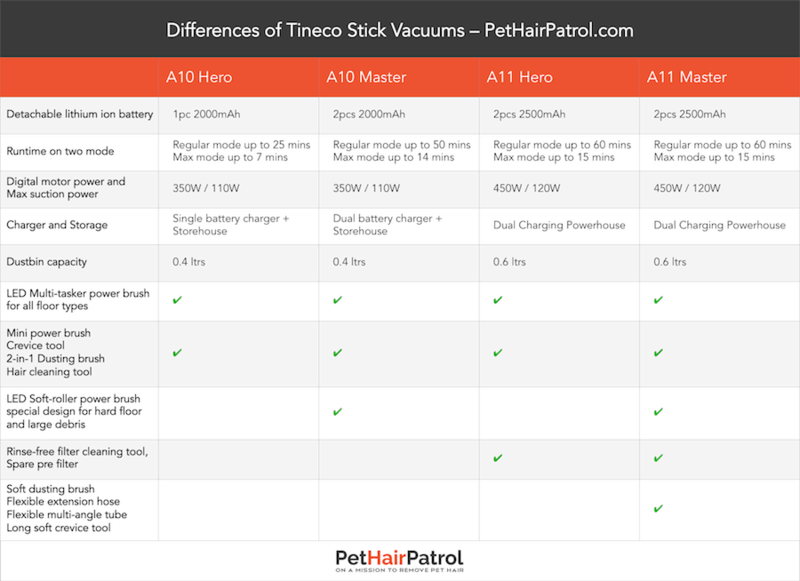 We can recommend the Tineco A11 (and A10 as well) for any pet owners looking for the best stick vacuum for pet hair. It has everything you need: powerful suction, long runtime, handy attachments, motorized brush roll, HEPA filtration, and a large dirt cup. And that’s not all folks! It even has those nice little add-ons that make vacuuming just that much easier: headlights, trigger switch lock, a rinse-free cleaning tool for the filter, and a Charging Powerhouse. We have to say the Tineco A11 stick vacuum is pretty near perfect when you consider its price point. The new Shark F80 is an adaptable and functional lightweight stick vacuum with many excellent features. It has the longest runtime on the market, and it moves easily from floor to carpet with the innovative DuoClean cleaning head. It also has the MultiFLEX feature for reaching under furniture, and it offers fantastic cleaning results. Check the latest price here. The F80 has the same functional features as the previous version like the DuoClean cleaning head and MultiFlex folding, but with even better battery life. You also get LED headlights, fingertip controls, and an exceptional 5-year warranty. This is an upper midrange vacuum with a reasonable price tag, and you might be wondering what’s the catch. Why does it seem like a too good of a deal? Well, first of all, the filtration is not up to HEPA standards and the dirt cup is quite small. Secondly, there may be some additional costs you need to factor in when considering this vacuum. Continue reading to get the quick overview of all the features, including the pros and cons you need to know. If you want the detailed version, you can follow this link to our full review. The Shark F80 offers a whopping 80 minutes of runtime when you use two batteries consecutively. Keep in mind though, that the 80 minutes is measured in the lowest suction mode with no attachments. Adding tools, turning on the ION Boost mode or vacuuming a tough surface will affect the runtime and bring it down to 2 x 10 minutes at the lowest. We love the interchangeable batteries because you can have one charging when you’re using the other one. However, it can be a bit of a hassle to switch the batteries, and with a charge time of 3.5 hours per battery for a full charge, you will run out of power after using up the two. The upgrade in the runtime did come at a cost. To amp up the runtime Shark had to decrease the strength of the suction of both suction modes. 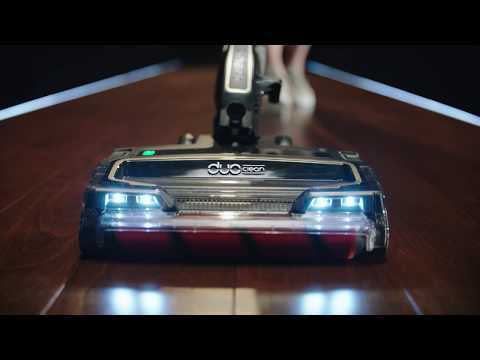 As the DuoClean brush roll mostly relies on brush roll mechanics to pick up dirt, the vacuum does still have great performance, but it does affect its ability to thoroughly clean high-pile carpets. As we just mentioned, it does have two suction modes: ION Power mode and ION Boost mode. It also has a MultiFLEX feature which allows folding the vacuum midway for a free-standing configuration. Also, folding the vacuum enables you to glide it under furniture without bending down yourself. That’s some effortless vacuuming! The F80 has three filters, which are all washable. Two pre-motor filters and one post-motor filter. Clogged filters may restrict the airflow why it is important to rinse the filters periodically. The filters may need to be replaced at some point, which is a small additional cost. The dirt cup is pretty easy to empty, but sometimes pet hair does get lodged inside the container, and you have to fish it out. Also, the dirt cup is smallish at 0.3 dry quarts, which means it might get packed with pet hair if you have more than one or two pets that shed a lot. You also get LED- headlights for added visibility and fingertip controls to make vacuuming as comfortable as possible. They also offer an exceptional 5-year limited warranty, which guarantees you can buy this product with a piece of mind. One of the best things about Shark stick vacuums is the DuoClean cleaning head. It combines a soft brush roll for hard floor materials and a stiffer brush roll for carpets in one attachment. You can change the speed of the brush rolls with the fingertip controls, but you don’t have to change the cleaning head between floor materials or compromise on the results. The DuoClean cleaning head ensures a polished finish on hard floor materials as well as a deep clean for carpets of all kinds. You only get two other attachments, though. The 8" Crevice Tool and the Upholstery tool are included in the package, but to add adaptability with more tools you have to purchase them online. This is another added cost you should factor in depending on your cleaning needs. The Shark F80 comes with a runtime upgrade that will probably interest many consumers. As most brands are slowly shifting towards cordless vacuums and phasing out corded products, the competition is fierce to have the longest runtime on the market, and this product does really take the first place in that regard. But as you can see, there are some other aspects where this vacuum does fall a bit short like the filtration, size of the dirt cup and additional attachments. Yet, we predict the F80 will become one of the bestselling stick vacuums on the market. It has already gained some pretty impressive ratings and reviews, and all the shortcomings are pretty small in comparison to other similar vacuums cleaners. If you’re looking for an upper midrange stick vacuum and the Dyson V10 is out of your budget, the Shark ION F80 MultiFLEX is definitely the one to consider. It’s pros easily outweigh the cons, and it’s one of the most well-designed vacuums in this category right now. Still not sure? Have a look at our detailed review or click over for some users reviews that might help you decide. The Shark IonFLEX DuoClean vacuum is another powerful and versatile stick vacuum that performs well with vacuuming up pet hair. It's basically the same vacuum as Shark f80, but with shorter runtime, lower price and stronger suction. It is a durable vacuum fitted with many innovative features to make your cleanup tasks no sweat. You can read what users say about this vacuum here. This cordless and bagless stick vacuum easily converts to a handheld vacuum and with the tools that come along you can use it for many kinds of cleanups. Although it is the heaviest of the top 5 stick vacuums, it is still easily handled and steered. carefully clean hard floor without scattering debris, while the second brush roll is sturdier to engage carpets closely and get them cleaned thoroughly. This innovative vacuuming head leads to excellent results on all floor surfaces. 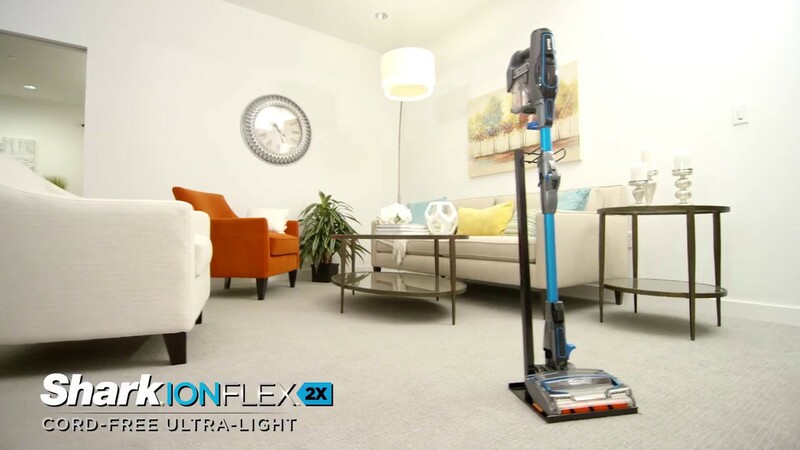 The vacuum also has the MultiFLEX technology, which allows you to fold the wand in half for compact storage in selfstanding mode or to reach under furniture effortlessly. With the rechargeable and removable lithium batteries, you have the option of getting a second Shark ION Power Pack battery to lengthen the runtime from 22 minutes to 44 minutes. Other features include headlights, sealed filtration with three washable filters, and an incredible 5-year warranty. 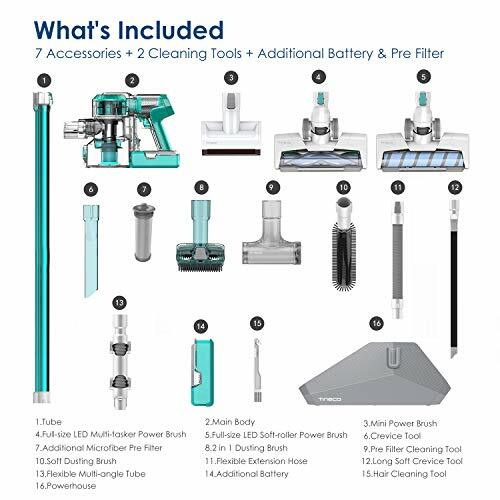 The Shark IonFLEX DuoClean comes with 5 attachments: DuoClean brush roll, Duster Crevice Tool, Anti-Allergen Brush, Dusting Brush, and Wide Upholstery Tool. These tools add versatility and enable you to vacuum above-floor areas of your home. The Wide Upholstered Tool works fine with pet hair, but to tackle that pet hair you should get the Shark motorized pet tool (sold separately). A high performing and easy-to-use 2 in 1 stick vacuum with many innovative features, such as the MultiFlex feature and DuoClean head. There are a few weak points, but all together this vacuum deserves its spot in the top 5 stick vacuums. It is a good choice for someone mainly vacuuming floors but wanting a handheld vacuum for those small cleanups. Shark IONFlex is a versatile and reliable stick vacuum, and it has excellent price-quality-ratio. The Bissell Bolt Pet is affordable 2 in 1 stick vacuum with some nice features designed for pet owners. A pretty basic but still functional and high-performing tool for small cleanups all around your home. A great choice if you have a limited budget. Click here to see the latest prices. Bissell Bolt Pet offers good results at a reasonable price. It’s a simple yet functional stick vacuum that has the ability to handle pet hair and other messes made by your pets. No frills, but everything you need for quick and effortless cleanups. many surfaces and deliver very good cleaning results. It is lightweight and smoothly maneuvered with a swivel head and two-way folding handle. By folding the handle forward, you can push the vacuum under low furniture without having to bend down, and by folding the handle backward, you can set the Bissell Bolt in the compact and free-standing storage configuration. The fade-free lithium-ion battery offers a good 25 minutes of runtime, and the extra large dirt cup makes sure you won't have to cut your vacuuming short to run to the trash can to empty the dirt cup. And when it’s time to dump the contents, you have the Clean-Turn system for hygienic cleaning of the filter. 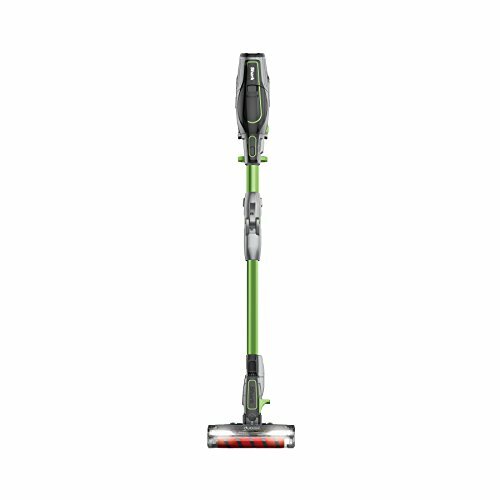 The Bissell Bolt Pet comes with the brush roll cleaning head for floors and 3 other attachments. The Advanced Pet Hair Brush Roll is for vacuuming hard floors and carpets, and it is rubberized to help pick up hair and debris. For cleaning upholstered items, you have the Pet Hair Nozzle Tool, which lifts up embedded pet hair and dirt. You also get the Crevice Tool With Dusting Brush for hard-to-reach areas, and the Scoop and Sweep Tool, which is very useful in picking up cat litter, food pellets or wood shavings. The Bissell Bolt Pet cordless stick vacuum offers a basic and affordable yet functional solution for battling pet hair all around your home. You shouldn’t expect top-notch bells and whistles, but what you can expect are some pretty handy features and good cleaning results. It is a good pick for a pet owner with a limited budget and the need to vacuum many different kinds of surfaces. Folding handle and functional tools add versatility. Marketed as ”the only vacuum you’ll need” – which actually might be true. 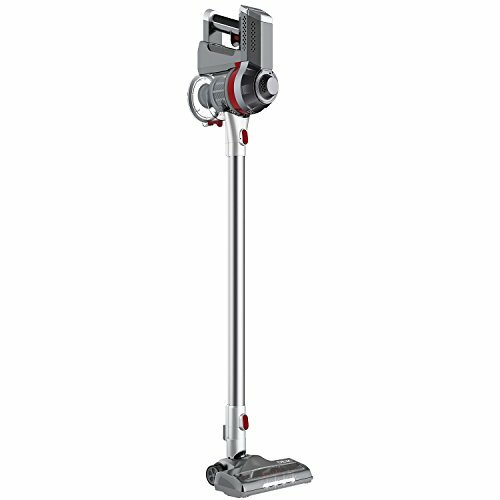 It’s a powerful and adaptable stick vacuum with premium design and excellent features. 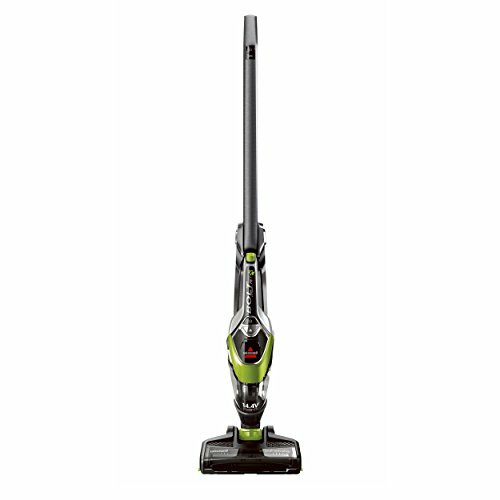 With the runtime up to 60 minutes and a powerful suction, it beats many sturdy corded upright vacuums in performance. Check out what real users have to say about Dyson V10. Dyson has re-invented their stick vacuum with the new in-line design. 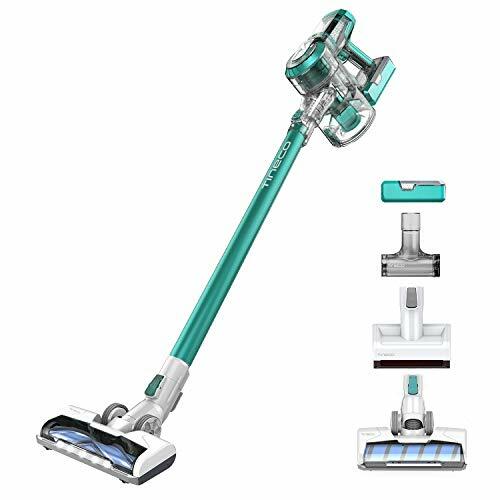 It has more power, stronger suction, longer runtime, larger dirt cup, and a more powerful cleaning head compared to their previous V8 cordless stick vacuum. It is the ideal vacuum for all kinds of cleanups – big or small, down low or up high. makes this vacuum the most powerful cordless vacuum on the market. The runtime is up to 60 minutes – although you should take note that the runtime is significantly less when using the boost mode or motorized tools. The runtime is still incredible for a lightweight vacuum with such strong suction. There are three power modes: Suction level I, Suction level II, and Boost mode. The cyclone technology and washable lifetime filter take care of filtering the exhaust air. The filtration is fully sealed, and it traps 99.97% of particles as small as 0.3 microns, which makes it a true HEPA filtration system. The size of the dirt bin has been increased by 40% up to 0.77 liters (0.2 gallons). It can hold a considerable amount of dirt and pet hair. And what every pet owner is bound to love is the hands-free and mess-free point-and-shoot emptying. There is no need to pull out strands of hair as the bin ejects all the dirt with a pull of a lever. The vacuum is very lightweight at just under 5.9 pounds. The weight distribution makes it easy to handle, although some users wich Dyson would replace the trigger grip. The trigger is light, and it saves the battery for when you’re actually vacuuming, but some users would like to see a basic power switch. The V10 easily vacuums all floor surfaces, and when it's time for above-floor cleaning you just detach the wand and use one of the convenient tools. Mini motorized tool – excellent for picking up pet hair! Soft dusting brush – for dusting window screens and other delicate surfaces. And, there are add-ons available online to add even more versatility. The wall-mountable charging dock is excellent, and it keeps your Dyson charged and ready to go whenever you need to do some vacuuming. If the battery is empty it takes 3.5 hours for full charge, which is normal with this type of vacuum. Although quite recently released, the Dyson Cyclone V10 is already getting great reviews and becoming one of the bestselling vacuums. Dyson has finally come up with a cordless vacuum that is comparable to upright vacuums while still having that versatility and agility of a lightweight vacuum cleaner. It has excellent features, and although the price is high it is worth the investment for anyone looking for a high-performing and easy-to-use top notch product. These bestselling Dyson vacuums are champions in versatility and functional design, with powerful motors and excellent performance. The new Dyson V10 has replaced them as the top dog of Dyson cordless vacuums, but they are way more functional than many other products in this category. Plus, you might be able to find an excellent deal online since they are a part of previous Dyson line-ups. Click here to check the latest price. Often pet owners need a versatile vacuum that can handle not only pet hair but all kinds of cleanups especially in those high-traffic areas like the hallway and kitchen. And this is where the Dyson stick vacuums come to the rescue. The Dyson V6 and V8 (just like the new V10) vacuums have powerful motors, superb attachments, and excellent adaptability. The attachments are well designed, and they enable this vacuum to handle all messes from the floor to ceiling. They have the same basic functions as the more advanced V10 with only small compromises in runtime, dirt cup capacity, and suction power. Since they are older models, you might even get them at an excellent discount. They are not as perfect as the Dyson V10, but a tough competitor to beat in the category of best stick vacuums for pet hair. The Dyson V6 does have some minor imperfections, which I have gone through in the full review, but Dyson listened to the remarks users were making, and they upgraded the V8 to have a larger dirt container, an even easier emptying system and twice the already good run time. The Dyson vacuums offer the most powerful cordless motors on the market. They have a strong suction with a fade-free battery which allows you to get full use of the suction power. The Dyson V6 offers 20 minutes of run time, which Dyson upgraded to 40 minutes on the V8 motor. Both vacuums have a maximum mode for tough jobs, but using it will take the run time down to about 7 minutes. 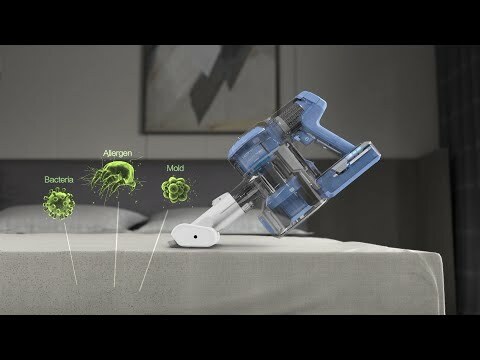 With the Dyson stick vacuums, you get two vacuums in one. With a simple click, you can convert the stick vacuum to a powerful handheld vacuum that you can use for vacuuming your furniture, car, shelves, ceilings, curtains, etc. Because of the lightweight design and weight distribution, these vacuums are agile and easy to use. They come bagless with a large washable dirt cup that you can quickly and hygienically empty with a simple push of a button. Filtration is done in two stages: the 2-tiered cyclonic filtration system uses centrifugal forces to efficiently separate dirt and dust from the air, after which the air is passed through a washable post-motor filter to make sure the exhaust air is as clean as possible. If you or your family member have allergies, there are models with washable HEPA filters available. The Dyson V6 and V8 vacuums perform well on low to medium pile carpets and hard floors using specially designed floor heads, that thoroughly pick up all dirt, dust and pet hair. Dyson also offers a wide variety of other attachments for other specific cleaning jobs. With these tools, you can be sure the vacuum gives great results in all areas of your home. Dyson has an extensive range of attachments and add-ons you can add to your vacuum. First, you need to decide which motor you want to buy; V6 or V8. All Dyson vacuums come with some basic attachments, but depending on the model you get additional attachments for specific cleaning jobs. For pet owners, I recommend the Animal and Absolute models, because they come with the mini motorized brush, which is excellent for removing pet hair from fabrics. All vacuums come with the Direct-drive brush roll head, which works well on hard floors and carpets alike. With the Absolute vacuums, you also get the Soft roller cleaner head, which is designed to vacuum up even the finest dust and dander you find on hard floors. Both floor cleaning heads are very functional and deliver excellent results. In addition to the essential tools like the crevice tool, brush tool and such, Dyson has many add-ons you can purchase separately to upgrade your vacuum even further. They offer many different attachments to solve all kinds of vacuuming needs, but for pet owners, the most interesting ones are the grooming tool and tangle-free turbine brush. Two outstanding tools with innovative design to help you fight pet hair. As an owner of two dogs, I have made use of many of the attachments, and I have found them to have top-notch functionality and performance. Sand, soil, food pellets, pet hair, dander… The Dyson has the solution to vacuuming up anything on any surface. The Dyson V6 and V8 offer fantastic adaptability and practical features for pet owners dealing with all kinds of pet-related vacuuming jobs (and all other messes as well!). They are not as advanced as the new Dyson V10, but if you can settle for a shorter runtime, they are a great choice for an all-around stick vacuum. The price is also on point now that they are no longer the newest Dyson model. As highly functional vacuums with many handy attachments, we can definitely say V6 and V8 earn their spot in the top stick vac line-up. An excellent mid-level vacuum with several useful features and generous set of attachements in the package. Click here to read real user reviews. The 2 in 1 design combined with some convenient, specialized tools makes this vacuum an all-rounder for the whole house and a fantastic choice for a pet stick vacuum. It is one of my top picks in this category because Hoover has managed to add several smart functions in this product and the vacuum gets very good ratings from users. automatically switches from floor mode to carpet mode optimizing the cleaning results on both surfaces. For above-floor cleaning, you can detach the handheld vacuum and use one of the tools designed for different purposes. Pet owners will be happy to know, that the dirt cup is extra large to fit all that pet hair and equipped with a handy bottom release system for emptying. With the fade-free lithium battery and Rapid Charge feature, your vacuum will always be ready to give you a full 27 minutes of powerful suction, and headlights and broad vacuuming path make your task even more comfortable. Cyclonic technology will do most of the filtering without clogging the vacuum, after which the air gets guided through a washable odor-minimizing carbon filter. Some users have reported clogging, but if you happen to be unfortunate and receive a faulty vacuum, the 3-year warranty will cover the replacement. The REACT Pet comes with 6 smart attachments: Crevice Tool, Dusting Brush, Pet Upholstery Tool, Pivoting Extension Tool, Powered Stair Tool and Reach Wand Tool. In addition, you get a handy wall mount for convenient placement of the vacuum. For people looking to get rid of all that pet hair taking over their home, the Pet Upholstery and Powered Stair tools will be crucial. The Pet Upholstery Tool quickly grabs pet hair with its rubber nubs, but if you need more thorough cleaning of upholstered items, you can use the Powered Stair tool with a brush roll. These two tools will do a meticulous job of removing all kinds of pet hair from different fabrics. The Hoover REACT is a suitable stick vacuum for someone looking for a reliable and mid-priced all-rounder that can manage pet hair on all surfaces. Users report minor problems, such as the vacuum not connecting with the app and the parts needing some force to be detached, but all in all this vacuum gets very positive reviews on its remarkable versatility and well thought out features. All stick vacuums get compared with the Dyson V10, and although the REACT does not quite reach the same level of finesse, it certainly gets close and deserves its place in this category. The Deik cordless stick vacuum comes in a lightweight 2 in 1 design to offer you versatility and ease of use. 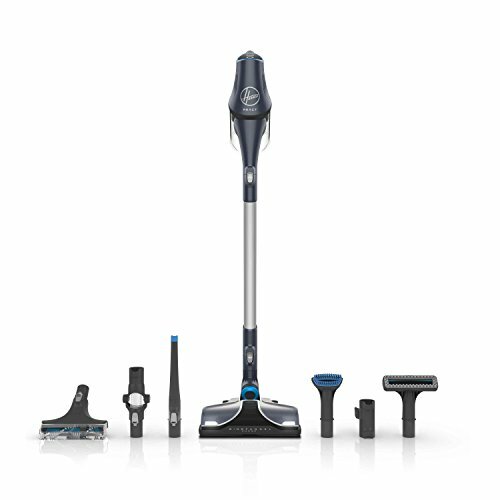 It is an excellent choice for a stick-type vacuum if you're looking for something similar to Dyson and you have a limited budget. Read real user reviews here. This vacuum is convenient for a pet home, as it turns from a stick vacuum to a handheld vacuum with one push of a button. With this kind of adaptability, you will be able to vacuum everything from the floor to ceiling including your furniture and stairs. is very good for a lightweight vacuum cleaner in this price range. According to user reviews and experiences this vacuum performs well on all surfaces and can tackle pet hair anywhere in the house. It has a powerful suction, which does fall a bit short when compared with the Dyson stick vacuums, but does the job. As the vacuum weighs only 4.7 pounds, the swivel head with the brush roll is easy to maneuver under and around furniture. It performs well on all floor surfaces, but we would recommend getting a sturdier vacuum cleaner if you have a lot of high pile carpeting. It comes with a 0.5-liter dirt container which is quick and hygienic to empty and wash under running water. The filter is a washable HEPA grade filter, which will be appreciated by those with allergies. In addition, there are a few little extras like the headlights that let you see better when vacuuming under furniture and the possibility to choose between trigger mode and continuous vacuuming. This Deik vacuum has a practical 2 in 1 design. When vacuuming floors, carpets and throw rugs, you can use the extension wand and wide swivel head to make your job easier and not having to bend down. If you need to vacuum your furniture, car or take care of small messes, you can detach the pole with a simple click and use the vacuum cleaner as a handheld vacuum. Along with this vacuum, you get three attachments. There is the crevice tool and a stiff brush tool which converts to a rubber-edged upholstery tool. These attachments are very practical in vacuuming up pet hair and dust from furniture, shelves, stairs, and other such places. The crevice tool, on the other hand, can be used for vacuuming bigger debris such as cat litter or food pellets, which the strong suction has no problem in picking up. The Deik 2 in 1 resembles the Dyson stick vacuums quite closely, and with a quick glance, you hardly see any differences. The Deik even has some nice extra features that Dyson does not, like the headlights and a HEPA filter in their standard model. Being so similar these two vacuums are naturally compared by people looking for this type of vacuum. From our research, we have to conclude, that Dyson is the top dog in this category with premium suction power and many practical add-ons. Having said that, the Deik 2 in 1 stick vacuum is not a bad choice either. There are many great features in this vacuum: It is easy to use, practical and performs well when it comes to pet hair. Though I would like to see more add-ons, some more suction power, and a tangle-free brush roll, there is one excellent feature, and that is the price. Buying guide - how to choose a perfect lightweight stick vac? Stick vacuums can be very practical and handy in a home with pets. You can have one as a primary vacuum if your home is not very big, or you can get one for smaller cleanups and maintaining a top-level tidiness between more thorough vacuuming. But what do you need to know to find yourself the perfect pet hair vacuum? The first thing you need to consider is the suction power. If you have high pile carpets and you think you need a vacuum with an extreme suction power to clean those carpets down to the last fiber, then an upright type vacuum cleaner will be a better choice for you. But if you have some carpeting in parts of your house and it is from low to medium pile, then a stick vacuum should have enough power to do an excellent job. Before some advances in technology, stick vacuums lacked suction ability. They were slim and lightweight, but they were used as the secondary vacuum to tidy up the hallway and kitchen with the weekly cleaning done with a sturdier vacuum. But today you can find stick vacuums that are very powerful, efficient and have a strong suction to pick up all kinds of dirt and debris you pets throw in front of you. All of the vacuums I recommend have been put to the test in real life and pet owners have given them a high score on performance and suction power. You can choose any one of these five, and it will do a good job with pet-related messes. The most important thing to keep in mind about attachments is that they need to pick up pet hair. Most vacuums can manage dirt, soil, sand, and dust, but pet hair is different. We all know how short and needle-like pet hair will cling onto fabrics and how long pet hair gets tangled in the brush roll and clogs up the vacuum. As a pet owner, you need your vacuum cleaner to have attachments, that really grab that pet hair and pull it up to be sucked into the dirt bin. A brush roll is probably the most effective type of attachment for clearing pet hair. You need stiff bristles to grasp the hair and pull it up to be sucked inside the vacuum cleaner. Another powerful way to attract pet hair is to use a tool that is lined with rubber or felt. A brush roll or a brush tool can also be very efficient in collecting dust, dander, and other finer dirt, but for bigger debris such as cat litter or pebbles, you need a crevice tool. You also need the crevice tool to get between the cushions and to reach other tight spots. To find an excellent vacuum for pet hair, look for these types of attachments. Some people prefer bagged vacuums because they are easy and quick to maintain. When the bag fills up, you just toss it away and replace it with a new one. Doing this, however, is not cheap nor environmentally smart. With a bagless vacuum you may have to empty and wash the dirt cup, but after the initial investment, there are no additional expenses. For pet owners, I would recommend a bagless stick vacuum. If your pet sheds a lot, you might find you have to change a bag very often, which can be expensive. Also, when you have a see-through dirt cup, it is easy to assess the need for emptying yourself. The vacuum won’t get clogged and damp pet hair won’t be left to form a nasty smell inside your vacuum. With the modern stick vacuums emptying of the dirt cup is quick and painless. It is done by releasing the bottom of the container or detaching the container from the vacuum. Either way, it is no hassle and won’t take you more than 30 seconds. Choosing a corded or a cordless stick vacuum comes down to your preferences. Some people want a corded vacuum as they feel a battery powered vacuum wouldn’t have the sufficient runtime to finish vacuuming. Many people, however, prefer a cordless vacuum because it saves them from the hassle of having to plug it in and make sure you are close enough to a power outlet at all times. Which one fits your needs, is a matter or personal preference. If you choose a battery-powered cordless vacuum, you need to pay attention to the runtime provided with a full charge and how long it takes for the battery to be fully charged. A runtime of over 20 minutes is good and will give you time to get some serious vacuuming done. It may sound like a short time, but my personal experience is you do get quite a bit of cleaning done in that time. The time needed for the battery to charge entirely depends on which type of battery the vacuum cleaner is using. Excellent vacuums need a lot of power to provide proper suction and spin the brush roll, so it may take quite a while for the battery to charge; 5-6 hours is not uncommon. It may feel like a long time, but if you keep the vacuum in the charger, it will most likely be ready anytime you need to do some vacuuming. If you or your family members have allergies or sensitivities to dust and dander, you should look for a vacuum with a HEPA (high-efficiency particulate absorber) – filter. To meet up with the US government standards, a HEPA grade air filter must remove 99.97% of particles that are 0.3 micrometers or bigger. Buying a vacuum with a sealed HEPA filtration system will ensure the exhaust air blown back into the air you breath is free of allergens and won’t cause symptoms for people with sensitivities. When comparing stick type vacuums cleaners, it is essential to take note of the weight of the vacuum. As stick vacuums are designed to be carried, the weight will affect how easy and comfortable it is to use. In a canister or upright vacuum cleaner, the weight doesn’t play such as significant role, as you push or pull the vacuum around. But for a stick vacuum to be practical and convenient, it should have a slimline and lightweight design. If your vacuum cleaner isn’t easy to use, you won’t be using it as much. You should note, that the weight is not the only factor though. Distribution of the weight is also crucial. If a vacuum is lightweight, but the weight of the vacuum is mainly at the furthest end of your hand, it will be heavy to lift. On the other hand, if the weight is concentrated in the motorized part you are holding, only the wand and vacuuming head need to be light to lift. There is one particular reason I mention price as one of the critical features to consider. With vacuums, the price often matches the performance. There are capable and efficient vacuums with affordable prices, and not all expensive products do a good job, but with a higher price, you tend to get better quality, better features, and better attachments. I try to pick out top performing vacuums in all price ranges so that all my readers can find a good fit for them. But in this category, there is one vacuum that I especially recommend, and that is the Dyson V10. It outperforms the other vacuums in power and versatility, but it also comes at a bigger price. If you can stretch your budget, it is a fantastic choice for anyone with pets at home. Putting up the dough just isn’t possible for everyone, but don’t fear. There are many other great pet hair vacuums of the stick type out there, and I have them reviewed for you. Our comparison table will allow you to quickly check out which vacuums would fit your budget the best. Is a stick vacuum the right choice for me? A stick vacuum is a perfect choice for anyone looking for an agile and adaptable vacuum to clean up all kinds of messes on all types of surfaces all around your home. Because most stick vacuums are cordless and lightweight, they can easily be carried around the house and used for not only vacuuming the floors but also on all above-floor areas. Stick vacuums are becoming more and more popular because technology has made considerable advancements in recent years. Just a few years ago stick vacuums had weak suction and short battery life. They could be used on quick cleanups, but most products weren’t powerful enough to pick up heavier debris to a satisfactory level. The recent releases in this product category compete with sturdy and powerful upright vacuums in suction power and performance. Cordless stick vacuums have become so powerful and popular, that brands like Dyson are focusing on the production of cordless stick vacuums, and slowly fading out bulkier models. A stick vacuum is the ideal vacuum cleaner for most homes, but sometimes getting one might require a change in cleaning habits. Because lugging out a corded upright for cleaning can be quite a burdensome task, most people try to avoid vacuuming. Unfortunately, the dust and debris don’t magically disappear by avoiding them, so people end up doing massive vacuuming sessions now and then. A stick vacuum requires a whole new attitude. Because it’s so easy to grab the vacuum, you can give it a quick spin every time you see something that needs vacuuming. You can use your stick vacuum for just 5 minutes daily or every other day for upkeep vacuuming. Not only will you be able to avoid spending the whole Saturday vacuuming, but your home will also be dust and pet hair-free every single day! Can a stick vacuum be powerful enough to wipe out pet hair? In the past, many stick vacuums were just the inferior version of an upright vacuum. Often they were corded and lacked some of the key features that make upright vacuums very functional and practical. But with advances in technology, many stick vacuums are incredibly powerful, and they have impressive batteries to power their strong suction. They don’t take up a lot of space, and they are very easy to pick up to start cleaning. My personal experience is that this is the best type of vacuum to keep the loose pet hair at your home under control. Because a stick vacuum is easy to use, lightweight and can handle cleanups from floor to ceiling, it is the ideal vacuum to abolish pet hair. With an easy-to-use vacuum cleaner, you will be more likely to vacuum often, and that is how pet hair won’t take over your home. 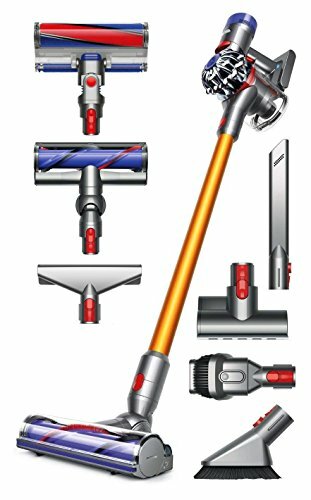 How to choose the right stick vacuum? With a stick vacuum, my experience is, that the first thing you need to consider is your budget. If you can stretch your budget and invest in a Dyson V10 Absolute, that would be my number one choice. If you have a tighter budget just have a look at the other recommendations I have picked out for you based on my research. They all perform great, and you just need to think of your preferences. What kind of features do you think you will find useful? Do the attachments match your vacuuming needs? Do you have allergies and need a HEPA filter? 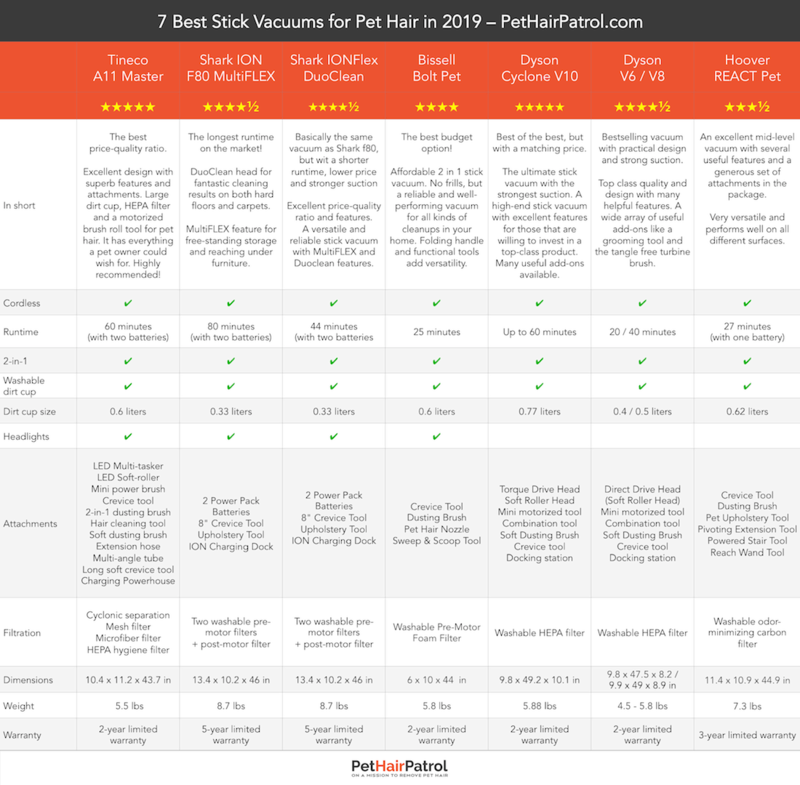 Just have a look at our full comparison chart to compare the top pet stick vacs and choose the one that fits your situation, budget and preferences. What is the best stick vacuum for pet hair? What is the best rated stick vacuum for pet hair? It is also lightweight, and the design makes it easy to use on all surfaces. Dyson vacuums are high-quality products at a high price, but they are worth the investment due to excellent features and durable materials. If you’re looking for the most advanced stick vacuum on the market, Dyson Cyclone V10 is the one to get. What is the best Shark stick vacuum for pet hair? Basically, these two vacuums are the same product with only small modifications. Shark IonFLEX DuoClean is the older version, and it has 44 minutes of runtime with two batteries. Although it has a shorter runtime, it also has a stronger suction and a lower price. Shark ION F80 MultiFLEX, on the other hand, has a whopping 80 minutes of runtime with two batteries - which is the longest runtime on the market. However, to increase the battery life, they had to decrease the suction power. That is why the older version Shark IonFLEX DuoClean has a stronger suction in comparison. If you're interested in Shark vacuums, and you're not sure if a handheld or a stick vacuum is a better choice for you, check out our article on the best Shark vacuums for pet hair. What is the best corded stick vacuum for pet hair? If you want a lightweight vacuum cleaner for pet hair, but you’re not really sure if a cordless vacuum is the way to go, there are some great corded vacuums on the market as well. Buying a cordless vacuum for pet hair is the trend right now because many manufacturers are slowly moving form corded vacuum cleaners to cordless ones. With advancements in technology, cordless vacuums have become just as powerful and capable as corded ones, and in a few years, we predict most people will be buying cordless vacuums for residential cleaning. Cordless vacuums are so much easier to use, and they still have the same cleaning power. That said, if you feel like a corded vacuum is the right choice for you, you should definitely have a look at the bestselling Shark Rocket Ultra-Light Corded Vacuum. What is the best cordless stick vacuum for pet hair? If you're looking for the best cordless vacuum for pet hair, you have the right page. As a pet owner you probably know, that pet hair finds its way to every nook and cranny. A cordless pet hair vacuum is something that you can use on all surfaces and in every part of your home – even your car. You don’t have to deal with the hassle that comes with finding the closest power outlet and plugging in the vacuum. The vacuum is always ready in its charger, and you can give it a quick spin each time you spot a mess that needs urgent attention. The best cordless stick vacuum for pet hair is the Dyson V10. When you compare it to the other top rated vacuums, it has the best combination of features and barely any shortcomings. If the Dyson V10 is out of your budget range, you should have a look at Shark ION F80 MultiFLEX and Shark IonFLEX DuoClean. They are excellent mid-range vacuums with many excellent features that will benefit pet owners. Or, if you are on a tight budget, Bissell Bolt Pet is the one you should check out. 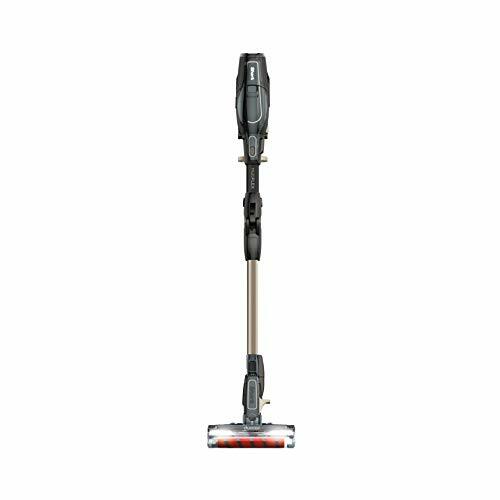 It’s a pretty convenient and versatile stick vacuum with many great features and a moderate price. What is the best stick vacuum for pet hair on hardwood floors? What is the best vacuum for keeping pet hair off a hardwood floor? Best vacuum for pet hair and hardwood floors? If you have hardwood floors and pets, you should be looking at F80 MultiFLEX or Shark IonFLEX DuoClean. They have an excellent attachment called the DuoClean cleaning head. It has two brush rolls, which makes it efficient on all kinds of floor surfaces. The first brush roll is very useful at cleaning carpets, but the second brush roll is what you need. It is soft and dense, gently cleaning hard floor materials like hardwood, parquet, laminate, and tile. Because it firmly but softly engages the floor, it also leaves a polished look removing all pet hair, dust, and dander. Another great option would be the Dyson Cyclone V10 because it has a Soft Roller attachment that perfectly cleans any pet hair, dust, and debris on hardwood floors. Do Dyson vacuums have a HEPA filter? All Dyson V8 and V10 vacuums have a HEPA filter regardless of the model (Animal, Absolut or Motorhead). However, the Dyson V6 vacuums only have HEPA filters in the Absolute version. The Dyson filtration system is sealed which makes it a True HEPA filter. This means that all the air must pass through the filter before being blown out and no particles will escape through small leaks in the casing. What is the best vacuum that does not clog? When you're looking for the best vacuum for pet hair, you probably know that loose hair can clog the vacuum causing the suction to fade. That is why the best pet vacuum always has a large dirt cup that can fit all that loose pet hair. If the dirt cup is too small, the hair will be packed in tightly causing the vacuum to clog. If you have one or several pets that shed a lot, we would recommend one of the Dyson vacuums, because of the size of the dirt cup and cyclonic suction that helps keep the pet hair from clogging the vacuum. Best vacuum for dog hair? It's not really about which animal you have as a pet, but rather what type of fur your pet has. All pet owners know that the pointy needle-like hair can cling onto all kinds of fabrics and be very tough to remove. If your pet has that type of hair, you should make sure your pet hair stick vacuum has a motorized brush roll tool. If, on the other hand, you have a dog with long hair that gets tangled around the brush roll, you might want to buy a vacuum that comes with a tangle-free brush roll. Dyson has an excellent tangle-free turbine tool for cleaning upholstered furniture and carpeted stairs. In the end, all of the vacuums featured in this article are ideal for removing dog hair. Best stick vacuum for carpet? 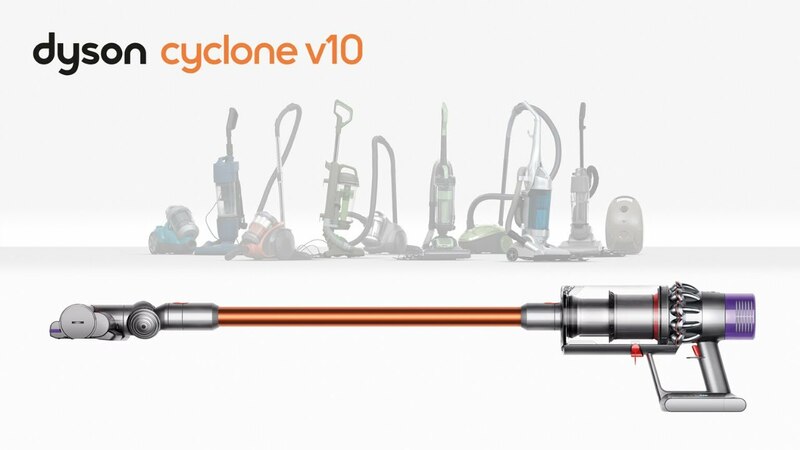 If you have carpeting in your home and you are looking for a stick vacuum that has enough cleaning power to keep them neat as a pin, you should turn your eyes to the Dyson Cyclone V10. It is a top-notch vacuum with a pretty steep price, but it also has what it takes to keep those carpets clean. Strong suction and the Torque Drive Cleaning head make sure that all dirt, dust, debris and pet hair is lifted from even those dense and thick area rugs. Although the V10 is the top dog when it comes to cleaning carpets, both Shark vacuums are very capable as well. We would even recommend the cheaper Shark IonFLEX DuoClean because although it is an older model, it has a stronger suction to help pick up all that dirt embedded into the carpet. Which one is the best vacuum cleaner brand and why? You can look at this question in a few different ways. If you’re looking for the most high-quality brand and a vacuum with the most advanced features, we will have to name Dyson. As a brand, they are known for producing very high-quality products with innovative features. They spend a lot of time and money on product development, but that, of course, is reflected on the price. The best brand could also be seen as the brand that has the best price-quality ratio. In that case, Shark would probably be the one on the top pedestal. They have highly functional vacuum cleaners at reasonable prices. They might not be quite as advanced and flawless in design as the Dyson vacuums, but they do have many great features, and they are very popular amongst consumers. Thirdly, you could also consider the best brand to be the one that keeps the price low by offering only the essentials features. In that case, Bissell could be your choice. Their vacuums are quite basic with no advanced features, but they get the job done, and the price is very moderate. Deciding on the best vacuum cleaner brand is ultimately a matter of what you prefer. Quality and advanced features over money, or a reasonable cost over the latest bleeding edge innovations? Best stick vacuum for pet hair under $100? We really wouldn’t recommend buying a stick vacuum for pet hair under 100 dollars because for a vacuum to be efficient at picking up pet hair, it needs to have enough power and adequate attachments you can’t find at low prices. There is no point in buying a cheap vacuum that is useless because it doesn’t have what it takes. Instead, you should consider stretching your budget by just a little. The Bissell Bolt Pet is a stick vacuum with a very moderate price and yet all the features you need a stick vacuum to have in a pet home. Scroll back up to check out the specs and to read the review. What is the difference between electric brooms and stick vacuums? Basically, the two are the same thing: a lightweight vacuum cleaner that can be corded or cordless. However, you could say a stick vacuum is a modern version of what used to be called an electric broom. By electric brooms, people usually refer to those vacuums, that are the lightweight versions of upright vacuums, but not as lightweight as stick vacuums. They are not as efficient as upright vacuums, but you can easily keep them at hand in the kitchen and hallway for quick cleanups. Electric brooms are usually designed to be used like sweepers – mainly for vacuuming debris off the floor. By stick vacuums, most people mean the modern, adaptable vacuums that have that lightweight stick-type design. Usually, they quickly turn into a handheld vacuum, and many of them are very powerful. Because of the advancements in technology, many stick vacuums are very potent, and the ones with a long runtime can replace a bulky upright vacuum in most homes. For a cordless pet vacuum, we recommend stick vacuums for two reasons: electric brooms are often not as powerful, and stick vacuums are more adaptable. Because pet hair tends to find its way to every nook and cranny in your home – including the upholstery on your furniture – you need a vacuum that can handle all surfaces, above-floor areas included. Did you find THE stick vacuum for your needs? If not, maybe some other type of vacuum fits your needs better? And if you liked this guide, have a look at some pet-related tips & guides here.